Maybe you are celebrating a promotion, graduation, or just looking to have a fun night out with friends. Grabbing a drink at your local bar is a popular pastime many people like to indulge in for a bit of fun. What if I told you that the bar could come to you. That is right, tiny bars exist and you could be a proud new owner of your own bar as soon as possible! Even better, this tiny pop up bar is perfect for entertaining friends and family in the comfort of your own home. How cool is that? 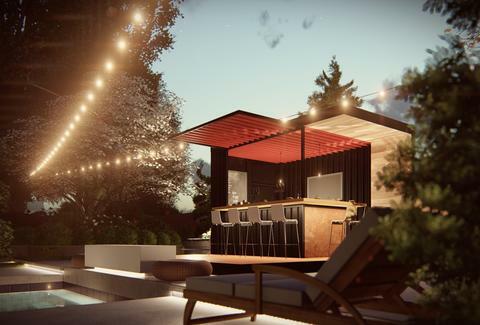 Introducing the Honomobar, an innovative pop up bar that is made from a recycled shipping container and designed to be a sleek, modern bar perfect for entertainment. The bar measures 8ft wide and 12’6 ft long and the total footprint equals 100 square feet. Even better, it can be shipped across North America and equipped to handle extreme weather temperatures from the freezing cold or blistering heat. It is perfect for your backyard, by the pool, at the lake house, in the mountains, by the beach, and anywhere else you could possibly think of. Even better, the price tag for this tiny bar is an affordable $19,764 USD and can be delivered within 4-6 weeks of ordering. As for the interior, there is a lovely 3 ft of cedar overhang, a black aluminum roll shutter used that can be locked up for the night and a lovely Canadian Fir treated butcher block counter top. As for the floor, it is painted with a non-slip coating and there is a hydraulic lifting arm (manual lift) for the main window. One key fact about this tiny bar which makes it convention and easy to own is the fact that it does not need a foundation.